From the summer 1948 issue of The Vegan (volume 9 number 2 pages 6-8. Available as PDF. 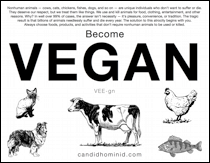 Learn more about Leslie Cross and the history of veganism. The following is an extract from the second part of a talk entitled "Animal Emancipation related to Human Progress," given recently to a Group of The Society of Friends. Let us consider the second broad aspect of man's relationship with the world of animals — the aspect by which man affects himself. Now it cannot be denied that when two elements, be they human, animal, vegetable or mineral, have contact, the effect is inescapably mutual. That is, that by virtue of the contact between them, each is affected. According to the nature and intensity of the contact, so is the nature and intensity of the effect. There is no act which does not have some effect, and there is no act involving two or more elements which does not affect each of them. What, then, is the effect upon man of the nature and intensity of his contact with his fellow-creatures? It is, I submit, this: that by the creation and continued employment of a code of behaviour which is cruel, parasitical and selfish, man injures not only those upon whom he inflicts his cruelties, his parasitical practices and his selfishness, but he inflicts restraints upon his own evolution. By fastening himself as a parasite upon his fellow-creatures he creates an anchor, as it were, at which the upward-aspiring element in his nature drags in vain to be free. In specialised instances, of which the slaughterer is one example, he inflicts upon this element not merely an inhibition: he drags it down in chains. It has been said by witnesses that in the shambles of Chicago it is difficult to believe that the men whose daily work is perpetual killing have the spark of humanity left within them. If that is an extreme example, it is nevertheless a symbol of the depths to which man may sink as the result of fundamentally immoral behaviour. In order to keep our thoughts largely upon the transcendental aspect of the relationship, I do not want to divert much attention to those physical results which, though of relative importance, are in fact incidental. But it does need to be stated that, if one accepts that there is order in the universe, it follows that ethical error cannot be scientific veracity. A number of diseases and ailments are no doubt traceable to ethical error in that they are brought about or intensified by the consumption of foods which have an immoral basis in that their production involves cruelty or violent death, or both. The coarse and heavy protein taken into the human body in the form of animal flesh and animal milk is a source of trouble, and it is significant that the incidence of cancer is highest in those parts of the earth where most animal milk is drunk. Milk-borne diseases are recognised even by those who take no account of the inevitable cruelties involved in dairying. Many indeterminate ailments may ultimately be traced at least in part to the use of immoral foods. There are, in addition, influences more subtle and less obvious than protein of the wrong kind. As the result of the terror which suffuses many animals at the moment of death, the ductless glands pour secretions into the blood. These glands are in some ways the link between the psychical and physical nature of all animals, including man, for, though their activation is primarily psychical, their effect is physical. The secretions aroused by terror cannot fail to affect adversely for him the flesh which man ultimately consumes. There are also further subtle influences only now beginning to be seriously studied — the non-physical, or vibrational, properties of food. While at the moment it would be unwise to base one's arguments largely upon these studies, it is probably not irrelevant to connect the modern habit of pumping animal milk into schoolchildren with the revelation by more than one educational authority of a noticeable increase in mental dullness. Certainly, it is not irrelevant to set against this the clear evidence that one of the characteristics of vegan children (who do not take animal milk in any form) is outstanding mental alertness. In the sphere of fundamental principle we have to consider the violence which is inevitable in the existing relationship. If violence, with its culminating peak in war, is undesirable, it is so because it is a principle withholding man from the attainment of higher and purer states of being. If violence between men is undesirable, how much less desirable is violence done by men to utterly helpless creatures? Again, the cheapness of human life cannot in a complete analysis be separated from the cheapness of animal life. "The only sin," said Emerson, "is limitation." We err, and we err greatly, when we limit the application of abiding principles to one section of the world's inhabitants. Animals share with us the habitation of this globe, and they are as entitled as we to the benefits of a natural and developmental evolution. We who might learn much from them and who might with love aid them in their evolution, offer them not love, not even tolerance, but a philosophy which is exemplified by the steel of the slaughterer's knife and of the bit in the horse's mouth. We conduct against them a war of aggression even less principled than the wars between men. Truly, he who says he loves peace cannot love peace wholly if he turns upon his fellow-creatures in an act of slaughter. One of the experiences of one who humbly and deeply seeks the truth is that, when higher feelings pervade his mind, he is unable to confine their application to the human race alone. When Paul Brunton, writing of man, refers to "the immeasurable Infinite that pervades his measurable being," he goes on to say that it speaks to him "of his oneness with all that lives, whether in the human or animal kingdom, and hence inculcates the primary duty of universal compassion." In the sphere of positive evidence, there are those rare but revealing glimpses of the way in which man's evolution is aided as the result of a reformed relationship with nature. Man has somehow slipped in this relationship, with undesirable consequences to both nature and himself. He is out of tune with nature — he bears a relationship to her which might be likened to a geographical fault. If he could return to his rightful place, if he could approach her as a friend and a lover instead of as a dissecting botanist and a murderous overlord, the resultant harmony would constitute a tremendous and incalculable evolutionary gain. One of those rare occasions when this has taken place is described by Adams Beck in his book "The House of Fulfillment." By an act of unpremeditated love, the author found himself in momentary friendship with the wild creatures in a Himalayan forest. He never had, he says, "a pleasure so pure and selfless as that perfect trust of a wild thing." It was a high point in his evolution, and while it lasted it overwhelmed him with an intensity of feeling whose effect never left him. "Does it seem much," he asks, "to spring from a small cause? How can I tell? I knew in that moment that I would break truce no more. Those wild bright eyes looked up into mine, and my shooting days were done." We cannot, even if we would, escape our kinship with all that lives. We may violate it — as we do — but in the end we shall learn that the price of violation is paid not by the animals alone, but also by the soul of man. Does it Matter if Vegan Cheese is Terrible?